World's 50 Best Restaurants – Don't Make Me Laugh! It's been a week now, but I'm still seething, when I'm not laughing. So why am I indignant yet amused? It's because of the joke that is San Pellegrino's World's 50 Best Restaurants. I find it laughable that some believe it to be a better guide than Michelin. Don't get me wrong, I don't set much store by Michelin but at least with their Tokyo and Hong Kong guides, they attempt to respect Asian food. In contrast, San Pellegrino features few restaurants in Asian cities that serve local cuisine. 1) Of their best 50, only four are in Asia, with the best-placed restaurant, Tokyo's Les Creations de Narisawa, in at No. 12. In the next 50, there are a further seven restaurants in Asia. So out of the best 100, eleven are in Asia. Did I mention that 60% of the world's population lives in Asia? 2) The best restaurant in Hong Kong is Amber. I'm sure it's very good but does modern French food represent the best of this fine foodie city? Of the three other restaurants in Hong Kong featured in the best 100, two also serve French food with the other, Bo Innovation, serving a molecular gastronomic take on Chinese food. It seems that the city's traditional Chinese restaurants just don't cut it. 3) That's because it would appear London, not Hong Kong, is the place to go for Chinese food, as Hakkasan is apparently the best Chinese restaurant in the world. Well at least you can't accuse the voting panel of not having a sense of humour. It's just that joke isn't funny anymore. 4) The best Thai restaurant in the world is also in London. Yes, that's right, there isn't a single Thai restaurant in Thailand that can compare to Nahm. This is getting more than slightly ridiculous now, not even the most partisan Londoner can surely believe that their home city boasts both the best Chinese and the best Thai restaurant in the world. Can they? 5) The Japanese can feel rightly aggrieved that despite Tokyo being lauded as the best foodie city in the world, it only has three restaurants in the best 100. Mind you, it's probably because standards aren't what they were in the home of sushi. Why else would the favoured haunt of the beautiful people, London's Zuma, be deemed the fourth best Japanese restaurant in the world? 6) And lastly, of the best 100 restaurants in the world, none are in those citadels of Chinese cuisine such as Beijing, Chengdu, Guangzhou, Shanghai or Taipei. I feel sorry for the 70 million plus people that live in those cities, as the poor sods can't get their hands on the best that their native cuisine offers. If only there was a Hakkasan that they could go to. In fairness, the voting process is transparent. It's just that the voting panel seem to be a bunch of ignorant bores (I'm being kind - I called them much worse in the original draft) that don't really get Asian food. Why else would they pitch up in an Asian city, and dine out at restaurants serving posh European food. Why not get down and dirty with the local cuisine? Oh well, their loss, not ours. And by the way, in case you're wondering, Noma came in at No.1. Feijoada is arguably Brazil's national dish, and being the food geek that I am, there was no way I was leaving Sao Paulo before sampling this pork and bean stew. 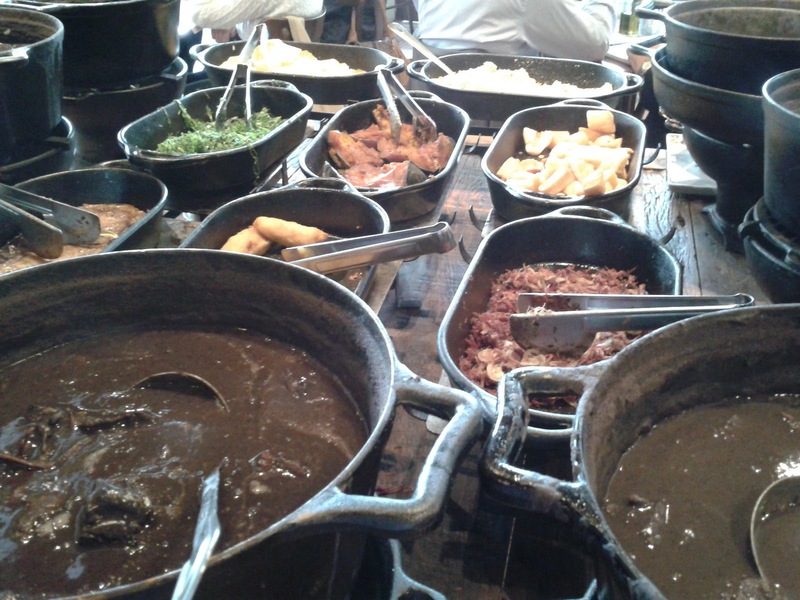 I had been expecting a stew where the pork and beans were mixed in together, but instead I was confronted with a buffet consisting of multiple cauldrons and side dishes. The first cauldron had black beans in it, with the others containing different parts of the pig. In no particular order, pork loin, spare ribs, ears, trotters, and two different types of smoked sausage were on offer. The side dishes included amongst other treats: pulled pork, collard greens, roast mandioca, banana fritters, farofa, and rice. 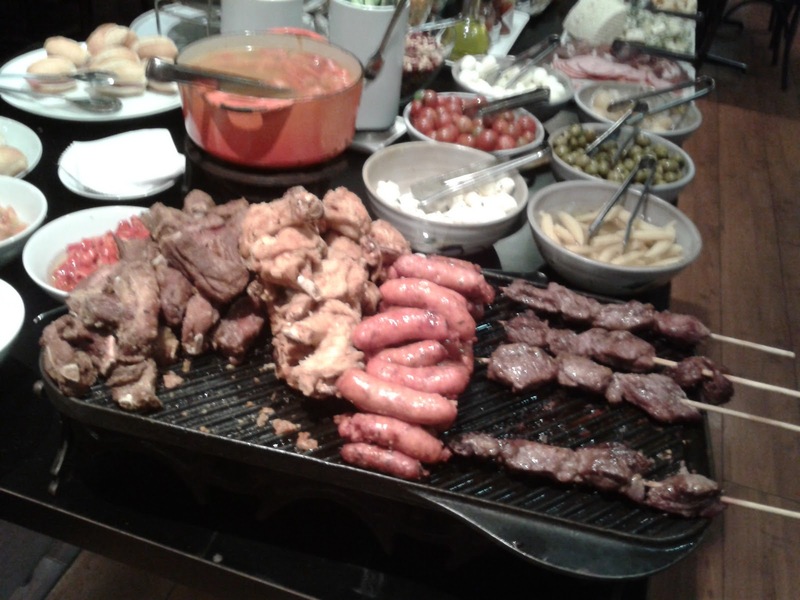 Now with such a spread, it'd be rude not to go for seconds, and I was tempted by thirds before I was reminded that I was going out for churrascaria that night. The purple-coloured stew wasn't too aesthetically pleasing, and I found some of the meat too salty, but otherwise I loved this dish. It was so full of porky goodness, so comforting and so moreish. The sides went really well with it too, particularly the pulled pork and roast mandioca. 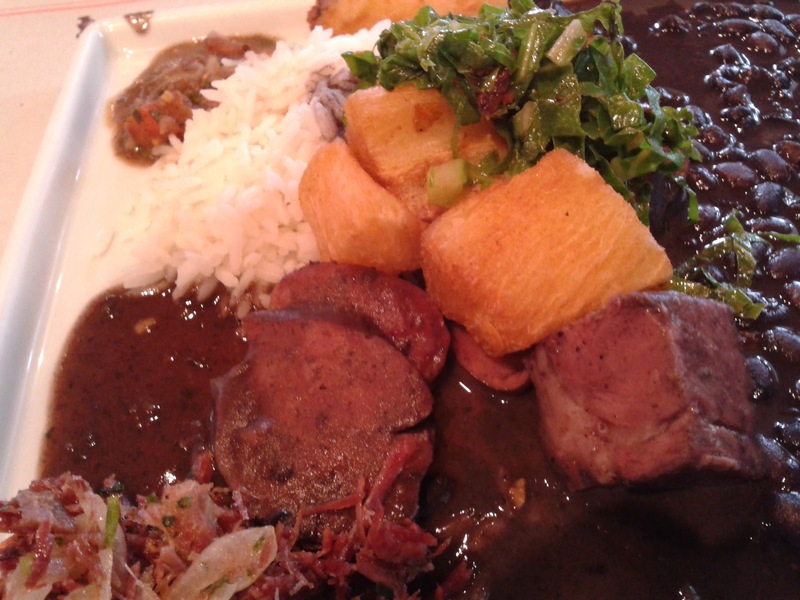 Feijoada tends to be served only at lunchtimes on Wednesdays and Saturdays (it's tradition by all accounts). So do make sure that you set aside one of those two days should you want to sample this dish. The feijoada featured in this post was from the charming Botica do Quintana, and whilst it was bloody good, I wouldn't go out of my way to eat there. The thing is Sao Paulo is such a vast city that you'd be better off finding a convenient eatery rather than get stuck in traffic. 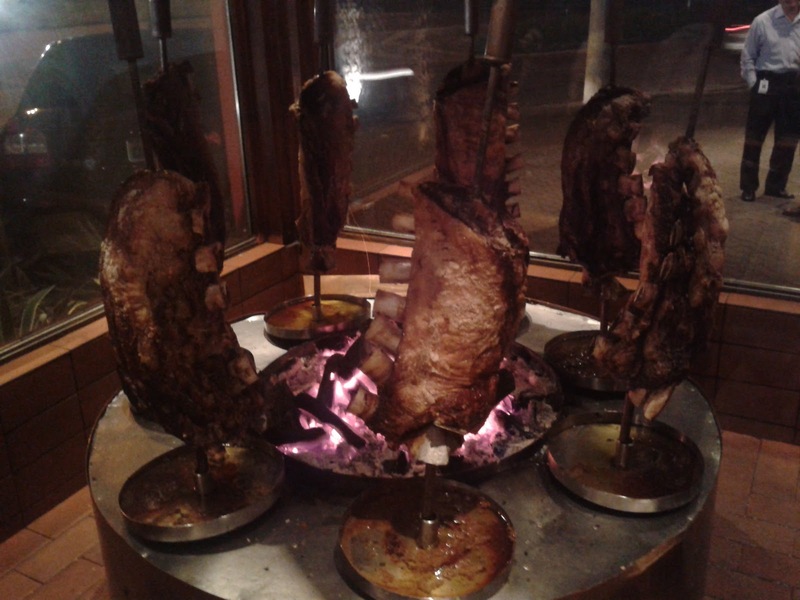 The other must eat in Brazil has to be churrascaria. To the uninitiated, these are steak restaurants, where passadores (meat waiters) come by with giant skewers of different cuts of beef, along with various other treats such as sausages and chicken. 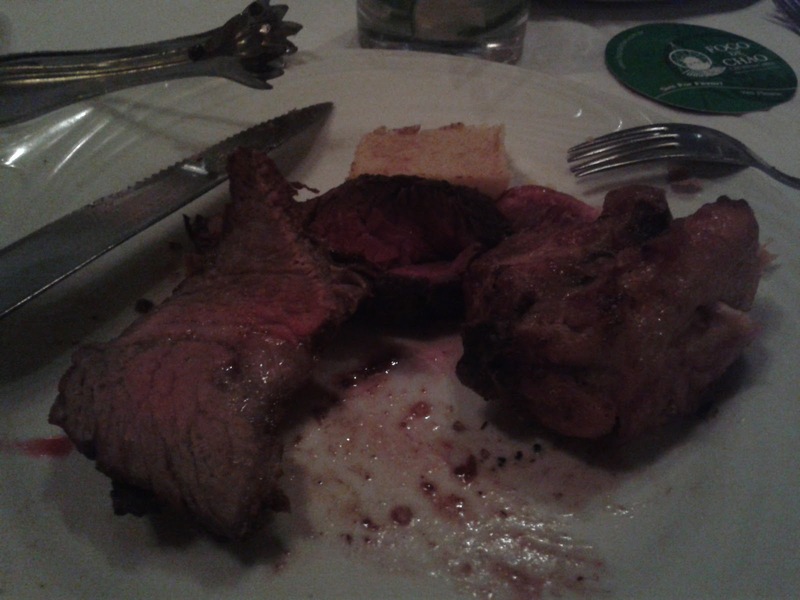 I was lucky enough to be invited to Fogo de Chao, an esteemed Sao Paulo churrascaria (muito obrigado to my colleagues, I really am lucky to work with so many great people around the world). As I'm a great believer of 'when in Rome', a caipirinha was duly ordered. And then the onslaught began with a giant pao de queijo. What happened next is a blur, as a swarm of passadores descended to push various cuts of beef, whose Portuguese names I can't remember. 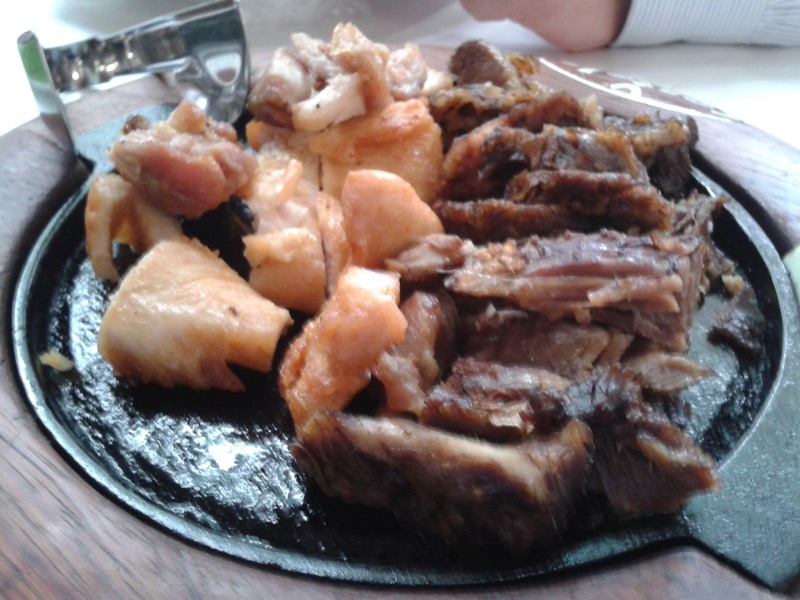 Locals consider the Picanha (rump cover) to be the best, but I'd be hard pushed to name a favourite. Every cut was amazing, with so much beefiness that I dare not eat steak in London for a good while. I also sampled the sausages and chicken, and they were damn tasty too. With hindsight, I should have had a better strategy in terms of pacing the meal. After all, the green and red cards that signify whether you want more food or a breather are there for a reason. I also shouldn't have eaten so much from the salad bar either, although Brazilian salads are excellent (and I'm glad that you voted in favour of eating salad in Brazil in my recent poll). Unlike Botica do Quintana, I'd make a special effort to visit Fogo de Chao, and as there are three branches in Sao Paulo, there's a chance that you won't spend too long in the notorious traffic getting there. I fell for Brazilian food on my trip to Sao Paulo in a way that I didn't for Turkish food when I was in Istanbul. Whilst it'd be fair to say that it isn't the most delicate or the most refined cuisine, there is an endearing, honest and hearty quality about Brazilian food. My only criticism is that it can sometimes be over seasoned and too salty. That aside, I've taken a shine to this cuisine, and I'm very keen to check out what London's Brazilian joints have to offer. Any ideas where to go? The word legend is one that is much overused but I can't think of a more apt description of John Charlick Foods. This shop isn't your run-of-the-mill sandwich shop; it also serves soup, salads, and at least one hot dish every day, stuff like lasagne or fish cakes. Throw in some homemade desserts like lemon tart, and suddenly eating at your desk doesn't seem that much of an ordeal. Back in the day, I used to work two minutes away from John Charlick Foods, but nowadays it's more like twenty minutes. Needless to say, I rarely make my way there but when the spring sunshine suddenly appeared recently, I decided to take a trip down memory lane. Sometimes nostalgia can play tricks but I'm pleased to report that little has changed here. I immediately went for an old favourite, roast beef and horseradish. It was just as good as I remembered, a made-to-order sarnie with loads of rare roast beef, fresh leaves, and proper horseradish in a top quality ciabatta roll. This is how all sandwiches should be made. PS: This post is dedicated to Mariana for reminding me of the brilliance of this place. 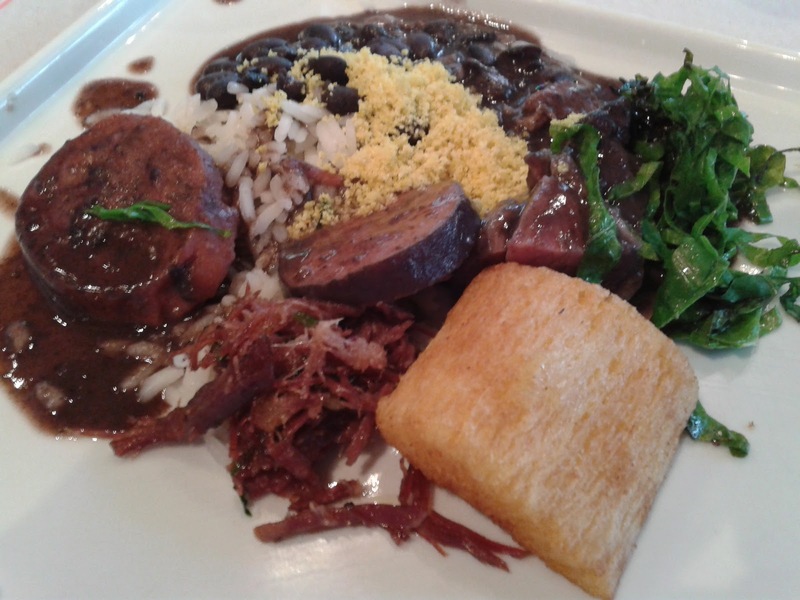 What I knew about Brazilian food before my recent work trip to Sao Paulo could be written on the back of a stamp. In large writing. 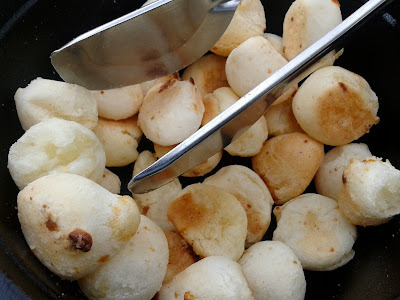 What I now know about Brazilian food can be written in two blog posts with a few photos. 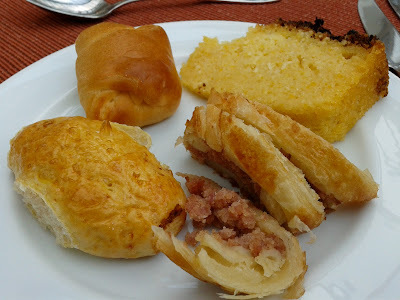 The various breads, cakes and pastries served as breakfast were definitely to my liking. I particularly enjoyed the banana-filled bread, corn cake, and bread filled with dulce de leche. 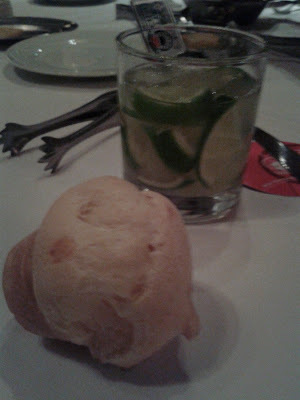 Other breakfast treats included the ubiquitous pao de queijo. The trick is to wait for a fresh batch of these cheesy bread balls to be served at the buffet before pouncing! Like many other countries, but sadly not Britain, lunch is taken very seriously in Brazil i.e. a proper sit down meal is the norm. Many lunch places are buffets or buffets augmented with cooked to order food. As there are throngs of office workers at these places, the buffet doesn't get too tired and wilted. In fact, there seems to be none of the stigma that can be attached to buffets elsewhere. 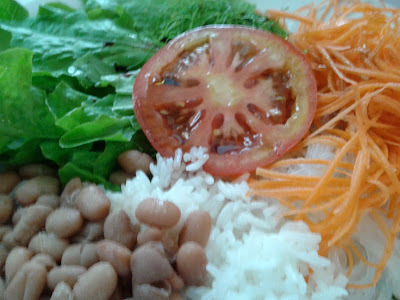 A typical lunch might consist of a self-serve helping of salad, feijao com arroz (rice and beans), and fried eggs. And as if by magic, when you return to your table, mixed platters of fried chicken, bbq beef brisket, pork loin and ribs are waiting to be devoured. Better than a sarnie, that's for sure! 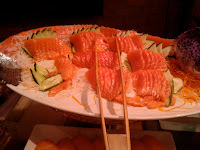 I also went for a buffet, one night for dinner, as it's a good way to sample a wide range of food when dining solo. 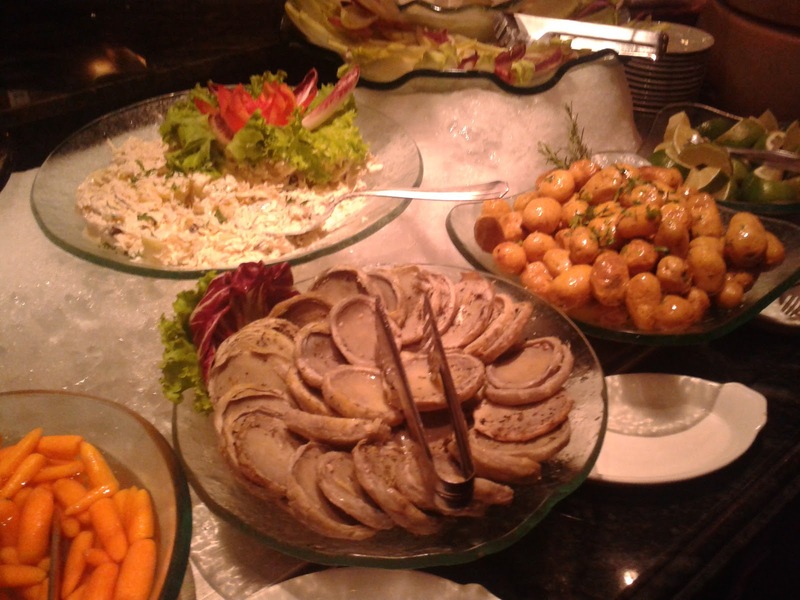 For a fixed price of R$23 (£9), you can order drinks from the bar up to this value as well as tuck into the buffet for 'free'. As you can see, there was a lot of meat including beef skewers, ribs, fried chicken and sausages. However, it was croquette corner that grabbed my attention. 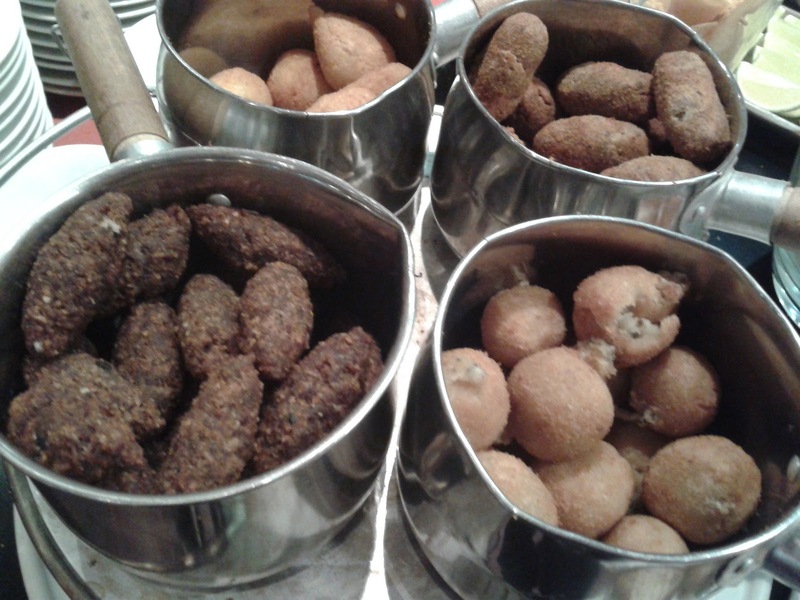 The bacalhau croquettes were my favourite. The city's Italian food is also very good, which should come as no surprise as Sao Paulo is Italian in the same way that Boston is Irish, if you catch my drift. 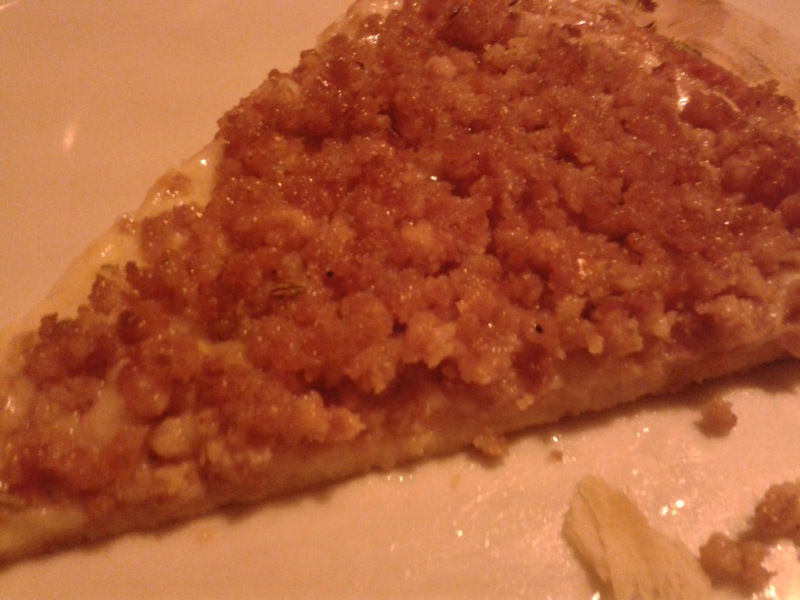 I enjoyed pizza from wood-fired ovens as well as pasta with a local twist of being mixed in with bacalhau. Regrettably, I didn't get a chance to go to Liberdade, Sao Paulo's Japanese quarter, but suffice to say, the sushi and sashimi that I did sample was very good. As good as the food in this post is, I'm afraid you're going to have to wait for Part 2 for the really good stuff such as feijoada and churrascaria. Excited? You should be. Postscript: A friend of mine expressed surprise that I ate salad in Brazil, as he believes their tap water isn't safe enough for vegetables to be washed in. He kind of has a point as I only drank bottled water in Brazil. That said, I think his point of view is over-cautious and offensive. Or to quote the exact words I used in the pub, I told him that he was being a complete knob. The irony of it all is that my friend has the cojones to climb Kilimanjaro, yet is scared shitless by the thought of eating lettuce in Brazil. Anyway, what do you think? Am I being harsh? Or is my mate right to fear salad in certain countries? Vote Now! Would you eat salad in Brazil? If there was ever a restaurant with my name on it! If only I hadn't already eaten dim sum that day, I would surely have gone to Manchester's BBQ Handmade Noodles King.